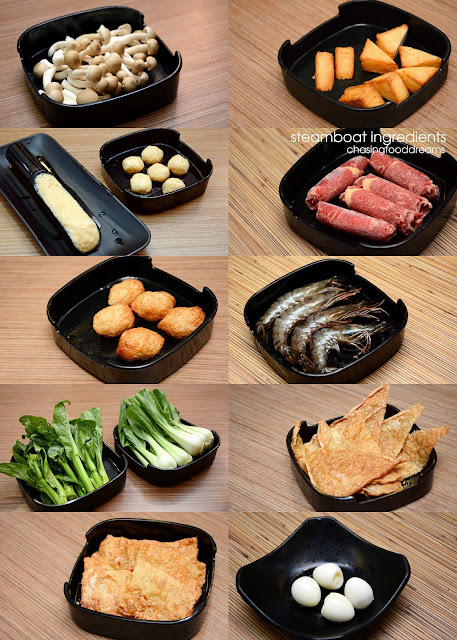 For something unusual on steamboat, head over to October Steamboat for a hotpot feast! Located at Paradigm Mall, October Steamboat is halal and serves up Malaysian’s local version steamboat along with some Chinese seafood dishes. The restaurant is spacious and there are two dining sections available. October Steamboat serves individual steamboat soups but there is a big table available for big dining party that wishes to share the family style steamboat servings. On one side of the restaurant there are few tanks holding live seafood. From live crabs to clams and prawns, there’s more than just steamboat at October. The menu is filled with lots choices. For steamboat, there are many choices of locally inspired soup base. From Chicken Soup to Asam Laksa, there is even a Herbal Soup. Besides those, there’s the favorite Signature White Tom Yum Soup and Nyonya Tom Yum Soup too. October Steamboat is also generous when it comes to sauces for their steamboat. One gets to choose from the many condiments and sauces available to make your own sauces. We took the big table since there were a few of us that day and opted for the Chicken Soup for our kids and the Asam Laksa soup for the adults. There are plenty of steamboat ingredients available. There are also set ingredients with a little of everything. We had the Set B which is good for 3-4 persons (RM72.54). These sets are certainly value-for-money. Fully filled with lots of ingredients such as fish slices, prawn, cuttlefish, handmade fish ball, chicken ball, cheese fish ball, fish & soya, fish cake, squid ball, assorted mushrooms and vegetables as well as noodles. One can add-on more a la carte ingredients such as Beef Slices (RM7.16), Prawns (Seasonal price), Seafood Fuchuk (RM6.13), Fish & Soya (RM6.13), Homemade Otak-otak Paste (RM14.42), Cheese Fish Ball (RM7.16), Handmade Otak Otak Ball (RM8), Seafood Taufu (RM6.13), Siew Bak Choy (RM4.05), Choy Sum (RM5.08) and Beech Mushroom (RM6.13). While they are nothing fancy, these are pretty classic choices that one can enjoy often. From the many choices of available, the Cheese Fish Ball, Fish & Soya along with the Seafood Fuchuk was a crowd pleaser, so much so these warrant a repeated order. While the Chicken Soup was decent, the Asam Laksa soup was deliciously yumm. Bold and robust with spicy and sour piquant flavours, the soup had lovely hits of spicy herbs and fish flavours. The longer the soup boils with all the ingredients, the more flavourful it becomes. Besides the steamboat, we also tried some seafood from the live tanks. The Salted Egg Crab (Seasonal price), though not big in size, was fresh and sweet. Deliciously coated generously in salted egg yolk sauce, it was lip-smacking yummy. There’s also other flavours such as Kam Heong Crab, Kung Pao Crab, Sweet & Sour Crab and Marmite Crab too. The Kam Heong Clams (RM20.65) are good too. Aromatic and moreish in flavours, the clams were nicely cooked and the kam heong flavours are nicely balanced. From the snack section, the Fried Chicken Wing (RM11.31) and Fried Dumpling (RM9.24) were sufficiently tasty for snacking. One dish that surprisingly good at this steamboat joint is the Hokkien Mee (RM14.42). Braised till the thick noodles has absorb all the soya sauce flavours, the noodles also had some prawns and squid along with some vegetables. Decent place for steamboat and some seafood, October Steamboat should easily satisfy foodies who are shopping at the mall and looking for some familiar comfort food.